Outdoor living space. Our claret red kitchen is the centre of attention and the action. 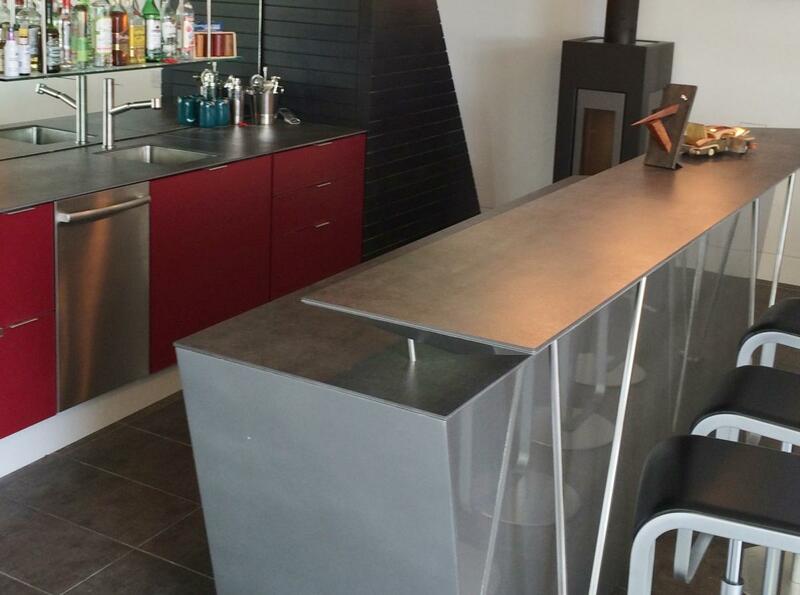 Home bar and entertainment showcase space. Claret red cabinetry encased in a custom designed and built island. IMDesign cabinetry and furniture lines are verstaile and an inspiration in your art studio, lounge, theatre space or guest cottage. Indoors or outdoors! We hired Santi to build weather-proof cabinetry for an outdoor BBQ in a modern beach-front home. He was able to match the paint colour we requested and make the cabinets fit perfectly to accommodate plumbing and gas fittings. They have been in place now for over a year and still look new. We were so pleased that we then hired him to build cabinets for a bar area and bathroom. These spaces were very unique, unconventional shapes, and again the cabinets fit perfectly. In conversation it also came up that we were looking for ideas to add bug screens to our commercial-style windows. Santi came up with a great solution, and provided screens for all the windows in the house. Truly great service. The owners are a treat to work with! A superb product, and they customized parts of it. 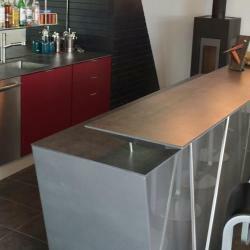 I love aluminum cabinetry!